The true price of a Kenyan Rose is €0,95. The true price is the market price of a rose which is €0,70 and the true cost is the social and environmental external costs of production, which for a Kenyan rose is €0,25. This figure illustrates how the price of an African rose is distributed throughout the value chain. 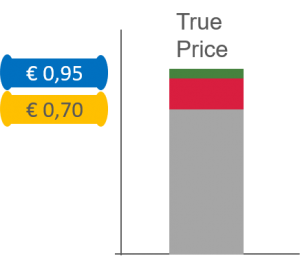 Description: The project True Price did for Hivos involved a calculation of the true price of a rose, which includes environmental and social costs. The social cost are mostly related to living wage gap: employee income below the living wage. Want to know the true price of a rose?